The president of the Space and Science Research Corporation, John Casey, is also the author of "Cold Sun: A Dangerous 'Hibernation' of the Sun Has Begun!" and has called attention to a meteorological cycle that until the global warming hoax occurred, was largely unknown to many people and, to a large degree still is. Nature has not cooperated with the charlatans who made claims about a dramatic warming of the Earth. Since 1998 the planet along with the Sun has been in a solar cycle distinguished by very few, if any, sun spots – evidence of solar storms – and a cooling of the Earth that has some predicting a forthcoming new Little Ice Age. As Wikipedia reports: "Solar Cycle 24 is the 24th solar cycle since 1755, when extensive recording of solar sunspot activity began. It is the current solar cycle, and began on January 4, 2008, but there was minimal activity until early 2010. It is on track to be the Solar Cycle with the lowest recorded sunspot activity since accurate records began in 1750." These cycles occur every eleven years. I was surprised to receive a news release from the Space and Science Research Corporation (SSRC) on Monday with the headline "Earthquake and Volcano Threat Increases" because, frankly, I could have put out the same release and, if such activity did increase, I could claim credit for predicting it and, if not, few if any would recall I had made such a claim. While earthquake activity has been studied for decades, even the U.S. Geological Survey (USGS) makes no claim to being able to predicting when or where one will occur. What the USGS can tell you is that their scientists (and others) "estimate earthquake probabilities in two ways: by studying the history of large earthquakes in a specific area and the rate at which strain accumulates in the rock." A translation of this is that they have only the most minimal clues when and where one will occur. A recent International Business Times article reported that this may change as the introduction of "big data analytics" kicks in to provide "a leap of accuracy of quake predictions." The SSRC news release was about a letter that Casey had sent Craig Fugate, the Administrator of the Federal Management Agency which "disclosed that we are about to enter a potentially catastrophic period of record earthquakes and volcanic eruptions throughout the United States." Casey's letter outlined "how the ongoing dramatic reduction in the Sun's energy output will not only plunge the world into a decades-long cold epoch, but at the same time bring record geographic devastation in monster earthquakes and volcanic eruptions." Other scientists have come to similar conclusions, but after years of sorting through all the claims about global warming and "climate change," one might want to tread lightly before embracing them. I asked my colleague at The Heartland Institute, Science Director Jay Lehr, for his reaction and he was quite candid. "I have read it and am extremely skeptical. It sounds like the agency is looking for some press and, of course, when they turn out to be wrong no one will be upset. No harm. No foul. Being ready for earthquakes in known quake zones makes sense; creating unwarranted fear does not." 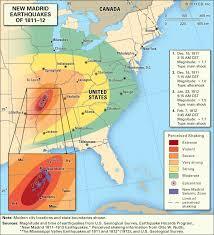 Will there be earthquakes here in the U.S.? Yes. The New Madrid earthquakes were the biggest in the nation's history, occurring in the central Mississippi Valley and so large they were felt as far away as New York and Boston, Montreal and Washington, D.C. President James Madison and his wife Dolly felt them in the White House. They lasted from December 16, 1811 through March of 1812 and there were more than 2,000 quakes in the central Midwest, and between 6,000-10,000 in the boot-heel of Missouri where New Madrid is located near the junction of the Ohio and Mississippi rivers.